The way we approach parenting our children need to change from child to child and as each child get’s older. This is one of the things that can make positive parenting so challenging. Just as we think we have it figured out, our kids change. But isn’t that what you were going for? A kid who is maturing and changing into the productive adult God desires them to be? Wouldn’t it be great if there was a road map or some guidelines on “how” we should be parenting our kids as they grow older? Well, there is. One of the things I’ve been able to document about kids over my years of working with thousands of youth in summer camp is the developmental and relational changes they go through from one age group to another. I’ve literally seen an entire generation grow up; one week at a time, once per year, year after year. And, I’ve seen trends in age gouging that I’m now applying to my own parenting. 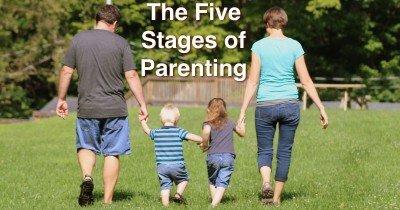 Here is a brief overview of the five stages of parenting. I’ve adopted the wording of each stage that I heard Andy Stanley use. Birth to approximately 1 year. Connecting. It’s important in the first several months for parents and kids to connect. A baby cries, and get’s comforted. A baby has every need met by a parent. A baby cries again and get’s comforted. This cycle continues and the child realizes that mom and dad are there for them. Mom and dad will take care of their needs. Mom and dad love them. Mom and dad make life safe. Mom and dad will be there. Training. In this stage of parenting, you’ll still be responding to and correcting behavior, but you’ll be adding in more training. Both in regards to skills, but also habits. Study habits, chores, choosing good friends, work ethic, etc. Coaching. In this stage of parenting, the name of the game is proactive vs reactive. With kids at this age, parents really want to focus on upcoming decisions vs how the school day just went.